Fripp Island ist zwischen Charleston und Savannah zentriert, nördlich von Hilton Head. Outlying Beaufort, müssen Sie über die Niederung Inseln und Sümpfen zu überspringen, über Dämme, vorbei an ein Staat Naturschutzgebiet und Park, um die Barriere Insel namens Fripp Island zu erreichen. Wird von Piraten als Ausgangspunkt in den 1700er Jahren, war es nicht bis vor 50 Jahren entwickelt. Es ist eine private, nicht überfüllt, zu sichern, Urlaub Gemeinschaft. Ferienhäusern und Eigentumswohnungen sind wenige. Über 50% der Einwohner sind Einwohner. Viele weitere der Häuser sind Zweitwohnungen. Die Fripp Island Club Resort, mit seinem Pool, Golf und Tennisanlagen, wird für die Nutzung durch unsere Gäste zur Verfügung! Es gibt zwei 3-Zimmer-Eigentumswohnungen, die jeweils Platz für 8. Sie haben angrenzenden 75 'durch 15' der Dauer Deck, 75 'aus dem Meer. Starten Sie eine Familie / Freunde Tradition! Diese Wohnungen können zusammen oder separat gemietet werden, je nach Verfügbarkeit. Haustiere sind nicht erlaubt. Die Eigentumswohnungen befinden sich neben dem Golfplatz, Blick auf den Ozean. Wir freuen uns darauf, unsere Stück vom Paradies mit Ihnen! The clean condo had big ocean views and in a great location for fishing. The condo was great. It was spacious, very cozy and nicely decorated. The view was beautiful. I would highly recommend this condo! It was very clean and nicely decorated. The view is fabulous and you can watch the sunset right out your backdoor. The kitchen is well stocked with just about anything needed for cooking. We had a wonderful week and can’t wait to return next year. Spacious, clean, and wonderful view! We've been vacationing at Fripp for 13 years now and have stayed in many condos on the island. This condo is in our top 3 of favorites! This quiet end of the island has become our preferred location. The condo was by far the most spacious 3 bedroom we've ever rented and also one of the cleanest. Another big plus: every bed in the condo was super comfy. Plenty of linens also supplied. Wifi had just been updated and was working perfectly. Kitchen was quite roomy, with the basics stocked. 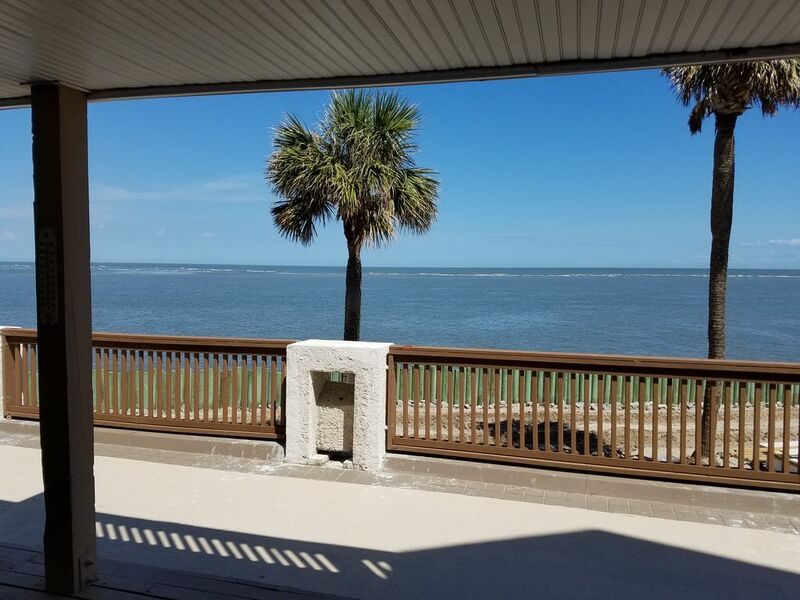 And you certainly can't beat the view off of the porch! Mary Beth was very prompt and thorough in all communication which was greatly appreciated. Would definitely like to return to this condo in the future! The stay at the condo was great. Having the amenity cards was NOT!. Used them once at Bonita's which I would not recommend. The waitress was great . Food OK but way way over the top on price for the same food you can get at Boondocks for 1/2 the price. Example, Flounder sandwich at Bonita's was $19.95, whereas, at Boondocks ( not far away ) $8.95. The only thing the amenities would be good for is the pools which you cannot use unless you rent a golf cart which you need the amenities card to get anyway. There is free access to the ocean along the beaches so who needs a pool. Save your money and don't get the amenities card . On top of it , if you get your card . Check in 4 pm the place you get the cards closes at 5 pm which means you but a 4 day card and you can only use it for 3 days as the day you check out IT IS NO GOOD. DOH!!!!!!! Do not get the amenities card. A total waste of money. Condo was great. You do have bring you own TP but hey . Also, don't forget laundry detergent which is NOT provided. The place was great. I'm glad you enjoyed our condo. Sorry you were disappointed with the amenity cards. In the future, I will try to do a better job describing the positives and negatives of spending the extra money on these cards. I would recommend that future renters have a phone conversation with the owner regarding any questions they may have before they arrive. We have upgraded our wifi in May of 2018.